If you want a Roomba that can be controlled using voice commands courtesy of Amazon Alexa, you better be prepared to pay $350 or more. Roombas are great and all, but there are comparable models out there that work with Alexa and cost way less. The ECOVACS DEEBOT N79S Robot Vacuum Cleaner is a perfect example. 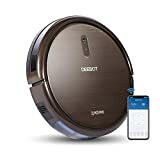 It has all the features you would expect from a modern robotic vacuum cleaner, plus it supports Alexa so you can command it to clean your home using a simple voice command. It’s on sale right now on Amazon for just $199.99 after the discount and the on-site coupon, so definitely grab one.